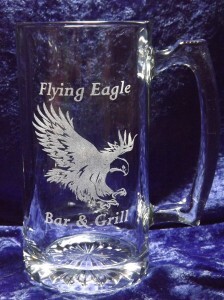 Enjoy your favorite frosty beverage from this classic 13oz Heavyweight Handled Mug. Have a fraternity or club? Or maybe you own a bar, or perhaps you’d just like to commemorate a great event. 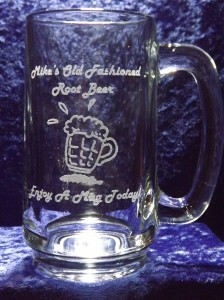 Our personalized custom beer mugs make a one-of-a-kind unique gift for beer & beverage lovers of all kinds! This is the Granddaddy of all mugs. This 27oz Heavyweight mug is perfect for Sports Parties, Groomsmen Gifts, Event Awards or anytime you need a solid glass for holding your favorite beverage. This is no flimsy thin glass mug that you are afraid to hold because you think it might break! This mug will last for years to come. These oversized glass mugs are laser engraved so the image will never wear off. 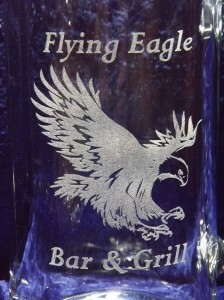 Each glass can be engraved with your custom text, logo or graphic. Have questions? Don’t hesitate to ask!